First Line: Up in her private suite on the first floor, Mrs. Anabel Adams paced the deep red pile carpet of her sitting room, backward and forward and round and round. Inspector Lane Parry of Scotland Yard is stranded in the middle of nowhere in a blizzard, his car having gone into a ditch in the Sussex countryside. Staggering through the snow, he manages to find refuge at Beechlands, a place that he assumes to be a mental institution from the behavior of the people out playing in the snow. However, it's merely a country house hotel redone in florid Rococo style by its owner, Mrs. Anabel Adams. Mrs. Adams has assembled a party of guests in honor of war hero Lawton Lawrence, but when "Lawty's" body is found in the snow, Parry finds himself on a busman's holiday. Everyone seems to have a reason to want the hero dead. Can Parry himself stay alive long enough to find the killer in the snowbound hotel? This is the second of Sarsfield's three books that I've read, the first being Murder at Shots Hall. Sarsfield is as much of a mystery as her books, since she only wrote three, and no one knows what became of her. From the talent she showed us in these two Lane Parry mysteries, it's a shame we don't have more. The setting of snowbound Beechlands is perfect. Although renovated in what Mrs. Adams believes to be a very tasteful (and very red) Rococo style, it is an old house with rambling hallways, doors leading everywhere, and secret passageways. The weather means that no one's able to leave, and Inspector Parry can't get anyone to come take over the investigation. Sarsfield's main strength is in her characterizations. The cast here is particularly brilliant: the grande dame owner, the pickled war hero, a movie actress, potential investors, a couple of locals, a devoted servant, and others-- all of whom are hiding something, all of whom have possible motives for wanting Lawty dead. With the booze flowing freely, most of the cast resembles a flea circus on crack; none of them are capable of staying put, and they're constantly scuttling in and out of dark rooms on all the various floors of the hotel. I was enjoying the setting and the antics of the characters so much that I didn't make an effort to keep a scorecard as to who may have done it. 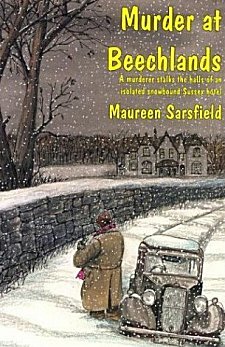 If I begin reading more vintage mysteries, it will be due to writers like Maureen Sarsfield. In my best Lawty Lawrence imitation, I raise a glass to her memory. Talk about great minds. I reviewed this as well. For my Monday Review. I've loved both of Sarsfield's books and so wish there were more. But it's not to be. Yvette-- I'm behind in my blog reading, or I would've seen your review. I was going to ask if you still needed a copy of this book!